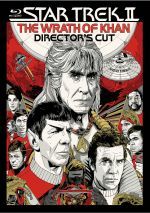 Over the years, Trekkie consensus has tended to view 1982’s Star Trek II: The Wrath of Khan as the best of the bunch. I agree with fan sentiment that Khan is a terrific film and shows the crew of the Enterprise in top form, but I'm not quite sure if I agree that it's the franchise’s pinnacle. I'm awfully partial to Star Trek VI: The Undiscovered Country. Actually, I generally like all of the Trek”original crew” films except for Star Trek: The Motion Picture and Star Trek IV: The Voyage Home, but Khan and Country seem like theit finest offerings. On a mission to find a lifeless planet for a scientific test, the Starship Reliant instead locates the crew of the Botany Bay, a 20th century craft led by a madman named Khan (Ricardo Montalban). He and his mates wound up on this planet after they clashed with then-Captain James Kirk (William Shatner) 15 years earlier, and Khan remains bitter about these experiences. This leads to a showdown related to the scientific project, a plan called “Genesis” that would bring life to desolate planets. Khan wants to use this as a weapon and Kirk plans to stop him. 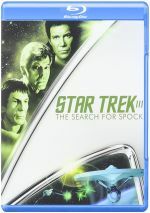 Star Trek II: The Wrath of Khan appears in an aspect ratio of approximately 2.35:1 on this Blu-ray Disc. I felt pleased with the presentation. Overall sharpness seemed good, as much of the movie appeared nicely detailed and well defined. A few interiors demonstrated minor softness, but those stayed in the minority, so the majority of the flick was accurate. Jagged edges and moiré effects created no problems, and edge enhancement remained absent. No print flaws popped up here. Trek movies often offer dense imagery, and this one's no different; it tended toward reds and other dark hues that don't always resolve well. For the most part, the colors stayed within the bounds of acceptability, and they often looked pretty good. Red lighting could be a bit thick, but not to a substantial degree. Black levels appeared dark and tight, while low-light shots demonstrated reasonable definition. This wasn’t an outstanding presentation, but it represented the original material well. As for the Dolby Digital TrueHD 7.1 soundtrack, it offered a pretty active soundfield. The front speakers got a nice little workout, with quite a lot of discrete audio in all three channels; the sound traveled well between the areas and added to the experience. The surrounds also received more use than you might expect from a movie of this vintage, but don't expect anything tremendous; their general usage tended toward ambient effects and music, and though a few split surround instances occurred, there's not much of that. Still, the surrounds contributed a nice sense of atmosphere to the film, and a few scenes – like those in the nebula – worked extremely well. The quality of the audio seemed less consistent. Most problematic was the dialogue, which suffered from a few minor issues. I thought speech always remained intelligible, but some edginess occurred. Effects also offered occasional bouts of distortion, but these were more expected, as they happened during explosions, so I felt less bothered them. Despite some crackling at those times, most of the effects appeared pretty clear and concise, and they even offered some decent bass at times; the warp jumps and ship fly-bys sounded deep and tight. How did this 2016 Blu-ray Disc compare with those of the original 2009 Blu-ray release? Audio appeared the same, as both discs offered seemingly identical TrueHD 7.1 tracks. Visuals were also pretty similar, but I thought the 2016 Blu-ray boasted small improvements. The new disc looked a bit better defined, and it lost the smattering of small print flaws from the old release. The new version didn’t give us a big improvement over the 2009 transfer, but it looked a bit better. 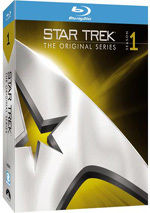 The 2016 Blu-ray includes two editions of the film. We get both the 1982 theatrical version (1:53:03) as well as a 2002 Director’s Cut (1:56:31). Most of the added 3:28 comes from short extensions or alterations to existing scenes. Actually, I believe all of the additions come within shots found in the theatrical cut. The most significant involve Peter Preston, the cadet in engineering. We learn of his connection to another crewmember and get some addition material related to him. My thoughts about the added scenes? They seemed worthwhile for the most part, but they didn’t make the film noticeably stronger. The only one I thought appeared incongruous related to Preston’s introduction. When Kirk jokingly disparages the engine room of the Enterprise, Preston insults the admiral. This seems tremendously improbable; a gung-ho rookie like Preston wouldn’t speak that way to anyone of superior rank, much less a legend like Kirk. Nonetheless, it’s interesting to see the movie with the slightly padded sequences. These don’t make the movie better, and I probably still prefer the theatrical version, but I appreciate the chance to view the extended Khan. The package provides two separate audio commentaries, and the first comes from director Nicholas Meyer. This track can be heard along either version of the film, but it was recorded for the 2002 Director’s Cut. Though the piece suffers from too many empty spots, overall Meyer offers a nice look at the production. He covers a variety of subjects; from sets to story to Trek continuity to working with the actors, Meyer gives us a fine glimpse at the creation of the film. I especially liked his discussion of how he got the best performances out of Shatner. For the second track, we hear from Meyer and Enterprise writer/producer Manny Coto. Both sit together for this running, screen-specific chat that accompanies the theatrical version only. Redundancy, thy name is this commentary! Meyer usually simply covers the same information found in the original piece. Not much new material pops up here, and the director occasionally rambles about literary allusions or how stupid everyone is today. Coto essentially acts as fanboy; he talks about his love for the film but fails to add much more to the mix. Outside of Meyer’s rants about the idiocy of modern society, this is never an unpleasant piece, but it drags and rarely engages us with new information. Another running feature arrives with the Library Computer. Available with the theatrical version, this “interactive playback mode” allows you to learn about various elements that crop up throughout the movie. It gives us notes about characters, technical pieces, and other connected tidbits. Some of these are tightly ingrained – such as facts about main characters – while others are more tangential. Because of the changing circumstances of the film’s world, some of the same subjects arise multiple times; for instance, new information about Kirk comes up as story elements affect him. Found on the 2002 DVD but not on the 2009 Blu-ray, we see a text commentary written by Michael Okuda, co-author of the Star Trek Encyclopedia. He provides a wealth of interesting notes. Okuda details all of the scenes added for the “Director’s Cut” and includes Trek lore like notes about Vulcan names, minutiae in the background, footage reused from the first film, effects, sets, story elements, and much else. Okuda even tosses in some gently snide remarks about the story and various inconsistencies. It’s a very interesting piece that added to my knowledge of the Trek universe. Under the Production banner, we get five featurettes. Captain’s Log offers a 27-minute, 21-second compilation of 21st century interviews with Meyer, executive producer Harve Bennett, and actors William Shatner, Leonard Nimoy, and Ricardo Montalban. Though the piece doesn’t really try to be a total overview of the film’s creation, it covers the most significant topics. We learn how the story was developed and the main participants brought into the fold and also hear a strong discussion of the film’s primary controversy. Some solid production anecdotes are tossed into the mix as well during this engaging and informative program. In Designing Khan, matters take a more technical bent. The 23-minute, 55-second program uses the same format as the “Captain’s Log”. We get interviews with production designer Joe Jennings, costume designer Robert Fletcher, art director Lee Cole, director Meyer, producer Bennett, and actor Montalban. These folks cover a nice variety of topics. We learn of the Navy influences that showed up in Khan, the challenges of the dogfight sequence, ship design, the new costumes, the invention of the rank insignia, set design, development of the Genesis device, and a bunch of other areas. The show moves at a brisk pace and includes a great deal of compelling material. Original Interviews offers 10 minutes, 57 seconds of clips from 1982. (Actually, only the first eight minutes and 15 seconds or so contain interviews; the remainder of the piece presents some interesting production photos.) We get information from actors Shatner, Nimoy, Montalban and DeForest Kelley. Some decent information appears, but for the most part, the data seems fairly bland, and some of it seems to be wrong. For one, Nimoy states that Meyer had a great love for Trek before he came on board, but during the commentaries, the director clearly indicates his prior ignorance of the show. And who dressed these guys, anyway? Nimoy and Kelley wore especially silly outfits. More technical data appears in the 18-minute, 15-second Where No Man Has Gone Before: The Visual Effects of Star Trek II: The Wrath of Khan. Again, interviews constitute the bulk of the program, as we hear from special visual effects supervisor Ken Ralston, computer graphics technicians Ed Catmul and Loren Carpenter, modelmaker William George, supervising modelmaker Steve Gawley, model electronics technician Marty Brenneis, and director Meyer. In addition to those segments, we see a nice variety of photos and test footage from the production; those elements help illustrate the work put into the film. As with the other featurettes, this one proceeds in a lively and informative manner that makes it quite enjoyable. “Production” concludes with James Horner: Composing Genesis. In this nine-minute, 33-second piece, we hear from composer Horner as he tells us how he came onto Khan and his work for the film. He provides nice insights as he digs into his score and themes. With that, we head to the three components under The Star Trek Universe. Collecting Star Trek’s Movie Relics lasts 11 minutes, five seconds and features notes from PropWorx CEO Alec Peters. He takes us through a mix of props he owns, and we also see some elements possessed by collectors Jay Wyatt, Joseph Cawley and Brett Leggett. Profiles in History owner Joseph Maddalena, Science Fiction Museum senior curator Jacob McMurray and Science Fiction Museum curator John Brooks Peck also appear. All sure seem enthusiastic about their collections, and we get a fun look at the memorabilia. For a glimpse at some serious fans, look no further than A Novel Approach. This 28-minute, 56-second program features interviews with authors Julia Ecklar and Greg Cox. Both write books placed in the Trek universe, and they appear here because they have tomes directly related to Khan; Ecklar did work about the Kobayashi Maru scenario, while Cox fleshed out Khan’s past with his novels. While not a great piece, “Approach” offers a decent look at dedicated Trekkies. On the negative side, at times it feels like it exists as a promotional deal. We hear a lot about the books and see far too many TV and movie clips. However, for less obsessive fans like me, it’s interesting to learn more about various facets of the series and its followers. For the record, Ecklar seems reasonably well-adjusted, but Cox clearly gets a little too wrapped up in Trek, as demonstrated when he nearly blows a gasket due to some continuity errors connected to Khan’s Sikh heritage. Starfleet Academy SciSec Brief 002: Mystery Behind Ceti Alpha VI rounds out “Universe”. It runs three minutes, seven seconds as it offers details about the fate of Ceta Alpha VI. It mostly just repeats information we learn in the movie, so it doesn’t provide especially valuable. The “Starfleet Science Officer” who narrates is pretty cute, at least. “Farewell” takes us to A Tribute to Ricardo Montalban. In this four-minute, 43-second piece, we hear from Meyer as he provides fond memories of the late actor. It’s too bad the show doesn’t include thoughts from others, especially since Meyer offers most of the same remarks in his commentary. Still, it’s nice the disc pays tribute to the performer. In addition to the film’s theatrical trailer, we get a 2016 featurette called The Genesis Effect: Engineering The Wrath of Khan. 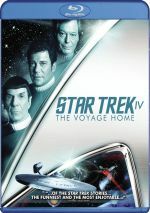 It runs 28 minutes, 21 seconds and offers info from Meyer, former Cinefantastique editor Mark A. Altman, producer Robert S. Sallin, post-production executive Ralph Winter, former Star Trek Communicator editor Larry Nemecek, “Save Star Trek Campaign” organizers John and Bjo Trimble, ST:TNG director Adam Nimoy, film critic Scott Mantz, Enterprise writer/consulting producer David A. Goodman, NASA flight director/engineer Bobak Ferdowsi, Big Bang Theory co-creator Bill Prady, Flash/Haven producer Gabrielle G. Stanton, Enterprise/Voyager writer/producer Michael Sussman, and Gene Roddenberry’s assistant Susan Sackett. “Effect” examines the movie’s road to the screen, with a look at budget, development, script and story areas, cast and performances, fan reactions and other topics. Some of this repeats from elsewhere, but enough new notes emerge to make it worth a look. Arguably the best film in the series, Star Trek II: The Wrath of Khan continues to work 34 years after its theatrical release. The movie combines action, intelligence and drama into one compelling package that make it a winner. The Blu-ray brings us largely good picture and audio along with a wealth of bonus materials. Though this turns into the best Khan video release to date, I don’t think it improves upon the 2009 Blu-ray enough to warrant a “double-dip” for most fans.